Hair plugs carry with them a slew of connotations. For a long time, they’ve been associated with outmoded, unnatural looking, and ill-advised hair-replacement procedures. Today though, they’re more advanced than ever. It’s worth looking at their interesting history – to fully take stock of just how much the technology has changed across a relatively short span of time. The term hair plug is often used interchangeably with hair transplant or implant, but that’s actually false. In fact, a hair plug is considered a sub-set of a hair transplant. Hair plugs were originally quite primitive. Hair plugs originally came into use in the 1950s, in the United States. They take their name from their plug-like nature: a grouping of hairs that were transplanted on to a recipient’s scalp, one-at-a-time, to replicate a full head-of-hair. Unfortunately, due to the medical technological limitations at the time, the result often looked far more ridiculous than it did convincing. This was especially so for severe cases of hair loss, wherein hair plugs just couldn’t cope with masking advanced hair loss. The technology failed to develop quickly, and remained more or less the same for the ensuing decades. Gradually, things improved, and the hair plugs became smaller and smaller, making hair plugs less noticeable and more realistic. Still though, it wasn’t enough, and by the 1990s, hair plug technology was replaced by Follicular Unit Strip Surgery. 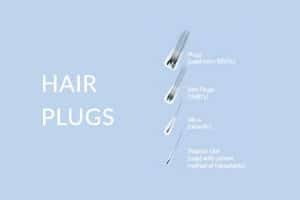 For these reasons, the hair plug technique became outmoded. Nowadays, the term hair plug is used as a shorthand for something that more closely resembles Follicular Unit Transplantation (FUT) or Follicular Unit Extraction (FUE). Despite hair plugs having fallen out of favour, it’s still important to reflect upon the impact they’ve had on this field. They were effective for a long time at giving people their hair back, restoring their confidence. Without hair plugs, researchers would never have begun searching for the alternatives which would eventually come to replace hair plugs. At Advanced Hair Studio, what we offer looks nothing like the hair plugs of old. Instead, we deploy our industry-leading procedures; Strand-by-Strand Blitz and Advanced Singular Hair Grafting which provide a seamless, convincing and completely natural way to transform your hair, restoring it to its old lustre.